Brewing beer is about creating a balance of flavors that work together to become greater than the sum of their parts. Take Sweet Action for example. It pits solid, rich barley squarely against tasty American hops… they duke it out till they both lie panting, and your brain is confused but your mouth loves it. That’s SWEET ACTION. Mixologists have the same goal. So we’re excited to see more and more beers getting used as a key ingredient in cocktails. Though some might call it blasphemy, we embrace the Mad Science of flavor creation. Not to mention, the history of blending and mixing beers goes back through all the great beer traditions. Whether it was Publicans mixing ales right before serving in England, or Belgian cellarmen blending aged sour beers, or barkeeps mixing soda and beer to create one of the most popular drinks in Germany. One of our very favorites for mixing is Jammer, since it delicately combines many elements of flavor. The light toastiness of malted barley, gentle aromatics from cracked coriander, the savory salinity of hand-harvested sea salt and the tartness of lactic fermentation. These various components come together for a complex Jam sesh, but there are other harmonies out there. So we teamed up with The Bearded Alchemist (Jacob Tschetter) to create some Jammer Cocktails. Jammer’s healthy carbonation, smooth salinity and tart finish contribute to the look, feel and taste of these concoctions. 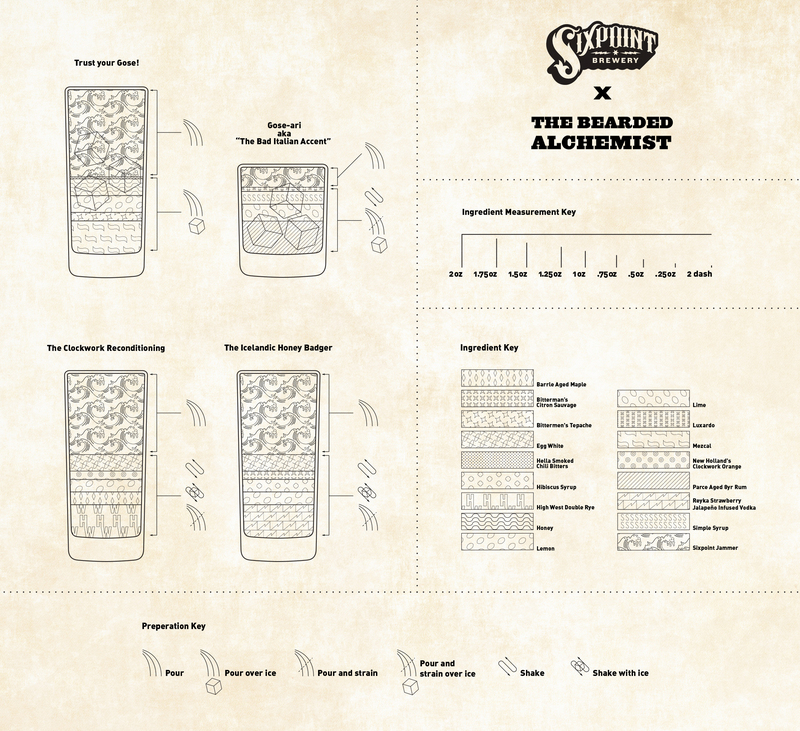 Using Jacob’s recipes, our in-house team created this infographic chart: it’s an all-in-one recipe guide for making Jammer Cocktails. Vigorous dry shake (to shake with out ice) for 10 seconds. Add ice and shake again (the wet shake).